Hoshizaki has a reputation for high quality, innovative and reliable products in water filtration. Their replacement filters are perfect food service applications, including ice machines. Their water filtration systems will help you keep your ice maker functioning at its full potential while reducing up to 99.9% of the chlorine from the incoming water supply. Additionally, these filters will filter our dirt and rust particles as small as Â½ micron, producing crystal clear ice. 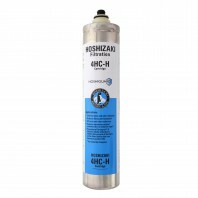 Discount filter store carries Hoshizaki replacement water filter cartridges that fit single, double and triple Hoshizaki filtration systems. Made in the USA, Hoshizaki replacement water filter cartridges can help protect your ice machine system for years to come by preventing built up and eliminating harmful chemicals. Every Hoshizaki filter is tested and certified against NSF standards, however, they do not eliminate or reduce fluoride.Weâ€™re here to help ensure you find the water filter you need. Having clean water is essential to a healthy lifestyle and family. In addition to ice machine filters, Discount Filter Store carries bag filters, camping water filters, and reusable coffee filters.